A supercharged engine when operating under boost, that is, with positive manifold pressure, will experience higher combustion pressures than a normally aspirated engine. The effect is quite similar to raising the compression ratio. The major difference is that a high compression engine experiences increased loads at all times whenever the engine is operating, while a low compression ratio supercharged engine encounters higher pressures only when under boost. 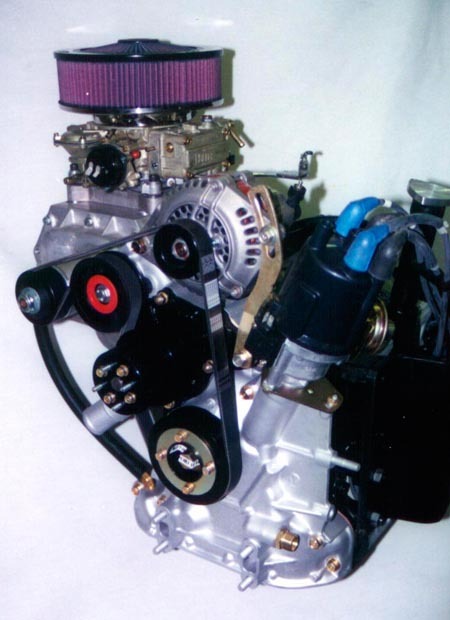 Most modem engines can withstand these increased pressures if proper consideration is given to fuel octane quality. As with any high compression engine, supercharged engines require the highest octane fuel available to minimize any tendency towards destructive detonation. Camden Superchargers recommend that boost be limited to 6 psi on an engine having a compression ratio of 8.5 to 1 when running on premium unleaded fuel of 92 octane. 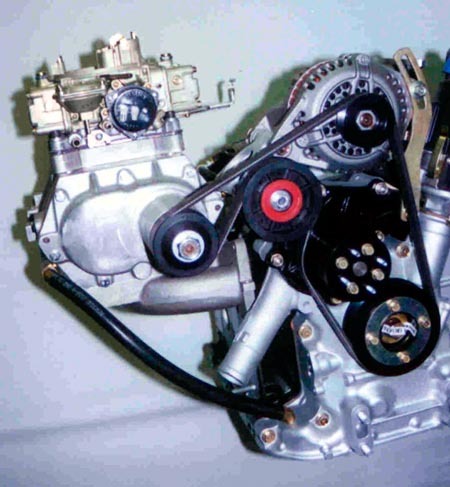 If your engine has a lower compression ratio, it is possible to increase the boost. Conversely, if your compression ratio is greater than 8.5 to I, it will be necessary to reduce manifold pressure to prevent detonation. If it is impractical to reduce the compression ratio of your engine to 8.5 to I or lower and you still want the performance gains associated with 6 psi boost, there are some options. First of all, you could use higher-octane fuel if it is available. As an alternative, octane-boosting additives are available, but their cost may make them unattractive for everyday use. Boost retard systems are available, which automatically retard ignition timing as manifold pressure rises. The major objection to these devices is as you retard timing you lose power. The rationale appears to be that it is better to lose a little power under boost than to destroy an engine under detonation. 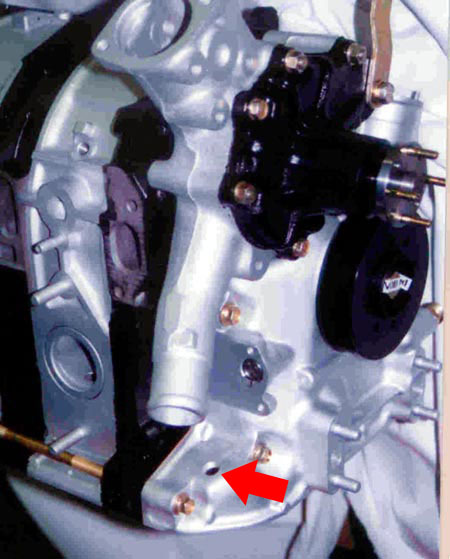 A type of boost retard can be accomplished by hooking the vacuum line from the distributor vacuum advance to the intake manifold. This will assure no vacuum advance is occurring while under boost. Another alternative which works well on borderline knocking engines is water injection. A system which increases the volume of water is introduced as boost increases is commercially available and has proven to be quite effective in controlling detonation. However, just do not run out of water when you are under full boost. Fuel mixture is extremely critical when operating under full boost as a lean mixture can lead to detonation. A boost enrichment system can be added to provide a slightly richer mixture under full throttle, max boost operation. The cooling effect of a rich mixture can prevent detonation under wide open throttle, full power conditions. If managed properly, the slight loss of power due to excessive richness will hardly be noticed. This supercharger kit has been designed specifically for the Mazda I3B 4 port manifold, serpentine belt drive automotive engine. Before installing the supercharger, you should verify that your engine is in good mechanical condition. A compression test or leak down test should be performed to check on valve and rotor sealing. A supercharger should not be installed on an engine that is in poor condition or that has low oil pressure. Socket set; 3/8 drive Metric and U.S.
Extensions; 3 in., 6 in. End wrenches, Metric and U.S. The Camden Supercharger System utilizes a Roots-type supercharger developed specifically for automotive engine applications. The present supercharger design has evolved from the first Camden Supercharger built in 1956. The experience gained from hundreds of installations in circle track race cars, sports cars, passenger cars, trucks, marine, and stationary engines has been applied to periodically upgrade the design for increased reliability and improved performance. Design features of the Camden Supercharger include extruded aluminum rotors with Teflon tip seals, pressure lubrication of rotor shaft bearings, flanged pulleys for Micro- V drive belt, one piece front extension, and multi-ribbed rotor housing. NOTE-Supercharger rotors have very close operating tolerances between themselves and the rotor housing. 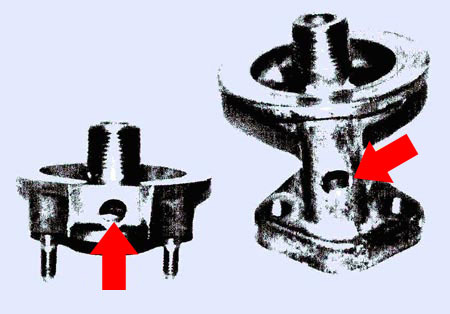 Any foreign object introduced through the carburetor flange opening can cause serious damage to the internal components. Keep the protective tape on both the inlet and discharge ports until the last possible moment. 1. Remove the stock intake manifold, crankshaft pulley, water pump pulley, and alternator pulley. Clean the face of the crankshaft hub of all grease and foreign matter, then install the supercharger crank pulley with the four (4) stock screws. 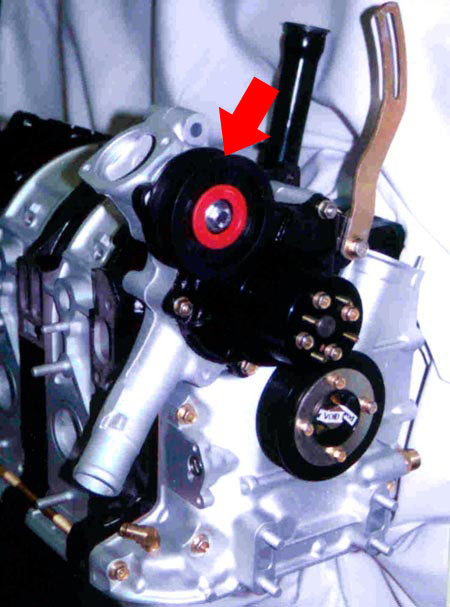 If belt driven accessories, such as power steering and air conditioner are used, install the stock accessory pulley(s) in front of the new crank pulley. 2. 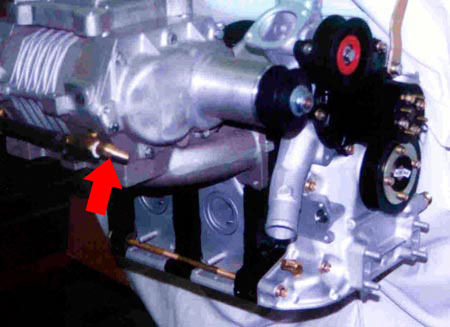 Install the supercharger assembly using a new inlet manifold gasket ( provided) and the stock bolts. 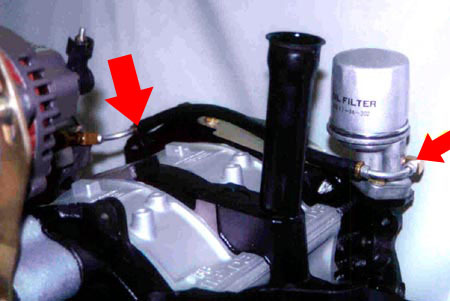 If a boost gauge is to be used remove the 1/8 NPT plug at the rear of the manifold and install the boost gauge line here. 3. Remove the oil filter stand and install the unit provided. 4. Remove the oil pan. Drill a 7/16 in. hole through the front cover and tap for 1/4 NPT. 5. Screw the adapter fitting with elbow into this tapped hole. Reinstall the oil pan using RTV sealant as the gasket. 6. Install the hose assembly between the hose fitting at the bottom of the blower and the drain back fitting installed in Step 5. 7. 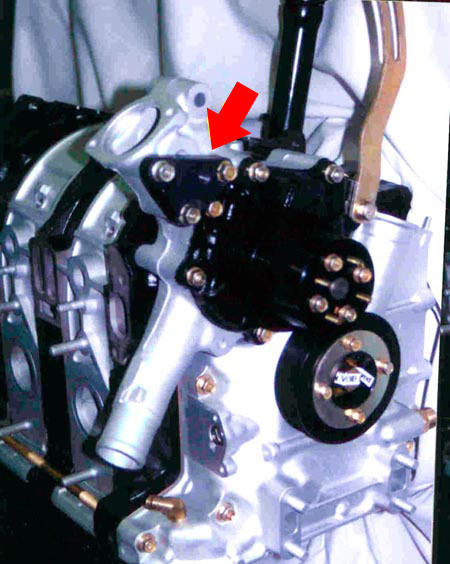 Install water pump pulley and alternator pulley using the stock screws and nuts. 8. Install idler pulley mount to engine using three (3) M-8X25 screws and three washers). Install the idler pulley using the 3/8 screw and washer. Torque to 18 ft lb. 9. Install belt. 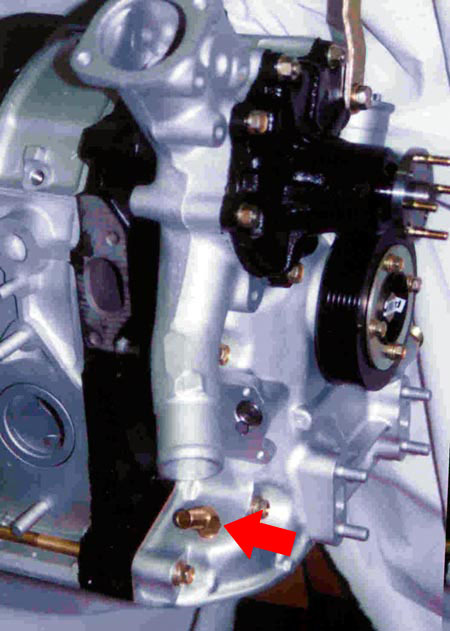 Adjust belt tension using the alternator. The belt is tensioned properly when a 20 pound force applied mid span on the tension strand of the belt results in a deflection of Yz inch. 10. 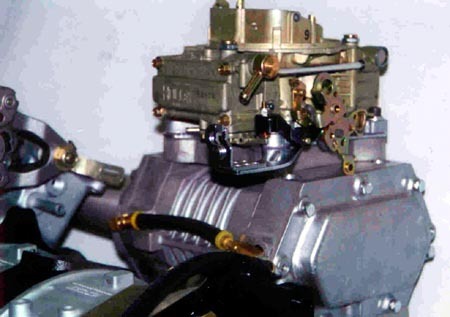 Install the carburetor of your choice. 11. 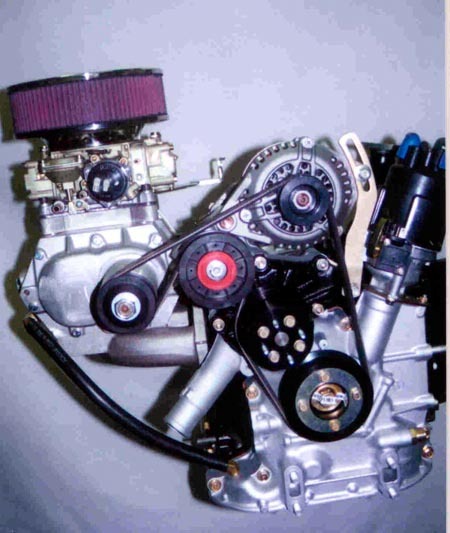 Start engine and adjust carburetor for a smooth fast idle. 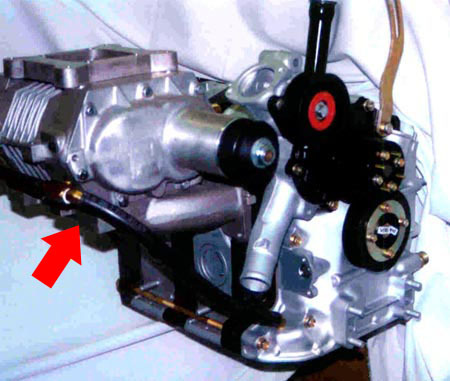 Allow engine to run for about 15 minutes to assure that lubricating oil has circulated through the supercharger. Check for oil leaks. DO NOT CRANK ON THE ENGINE FOR EXTENDED PERIODS OF TIME WITHOUT STARTING AS THIS CAN DRYOUT THE BEARING SURFACES INSIDE YOUR CAMDEN SUPERCHARGER.Your Camden Supercharger has been test run for a period of time on the factory testing bench to insure proper quality control and functions of your new unit. 12. Install a suitable air cleaner and secure any loose wires or hoses to tidy up the installation. Congratulations!!! You have just completed a Camden Supercharger installation. Now go out and enjoy the increased performance, but remember you now have a lot more torque available so use caution, particularly in low gear, to avoid excessive wheel spin or over-revving your engine. These supercharger kits are not for use on the highway or emmision controlled vehicles. All pictures submitted are copywrited and owned by Atkins Rotary Specialties.